In this hands-on construction job training program, you learn the skills you’ll need to get on the path towards a great career in the facilities construction and maintenance field. You will be assigned projects that included framing, plumbing, electrical, and drywall. Jobs for maintenance workers are expected to grow rapidly over the next several years. Once you graduate, we’ll help you find a job as a maintenance worker. Say yes to CET Building Maintenance! New career in 8-9 months? * yes! Training supplies, tools, books and uniforms included in tuition? ** yes! *Average program length based on attendance. ** Subject to change without notice. Where do the Building Maintenance job training classes take place? Train for a job in building maintenance on CET’s campus in Alexandria, VA. 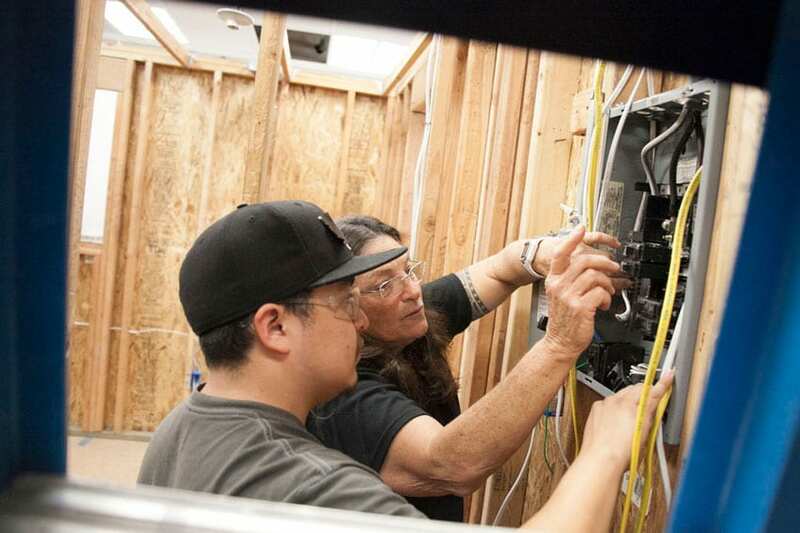 In addition to the classroom learning, you’ll have access to a fully working facilities and construction lab, working on hand-on projects like framing, plumbing, electrical, drywall and troubleshooting and repairing small appliances. How long does it take to finish the Building Maintenance job training program? With 30 hours a week of attendance, students usually finish the 900 hour program in 8-9 months. But we have an open exit. When does the next Building Maintenance class start? Right now! CET’s open enrollment means once your application is completed you can start the next day. What types of jobs can I find after I graduate? How soon after graduation will I start working as a maintenance worker? Every student’s experience is different, but according to the Bureau of Labor Statistics, the building maintenance industry has a higher than average job growth. To see what the job outlook is like for maintenance or repair workers where you live, go to onetonline.org and plug in your state in the section for “Wages and Employment Trends.” And with CET’s job placement assistance, you will always have ready help to find the right job. What can I expect to make as a maintenance worker? *Data as of August 2018. For additional information, including details on associated occupations, national and state wage and employment statistics, go to onetonline.org. How much does it cost and how can I pay for Building Maintenance job training program? Training to be a maintenance worker costs $12,954 including your training supplies, books, tools and uniforms. If you qualify for financial aid, you may be eligible to receive grants, scholarships and/or federal student loans. What if I didn’t graduate from high school or don’t have my GED? At CET you may have options without them. Be sure to tell the Admissions Department so they can guide you through the eligibility process. Class size is approximately 20-25 students and varies by the type of program. Do you provide any certificates needed by employers? The Building Maintenance technician certificate shows an employer that you are ready for an entry level position in the facilities construction and maintenance field. What do I need to get started in the maintenance worker job training program? Are there any high school math classes I need to get started? No. You’ll get everything you need in the maintenance worker class, including vocational English and math. Additional one on one tutoring is available, if needed. CET is national, but what about the graduation and job placement rates for maintenance workers my CET location?